USA Volleyball announced a new partnership with Juice Plus+ as the national governing body's exclusive partner. Together, Juice Plus+ and USA Volleyball will promote healthy living habits. After May 1, we will no longer provide an extra “Qualifiers Day” for you to place orders for the previous month’s business. Recent advances in our system processing speed now allow you to get a full view of your current “business month” on any given day, eliminating the need for that extra day to make sure you qualify for bonuses and promotions. This change will also speed up the payroll process and simplify our (and your) business by not having to move orders from one month to another. 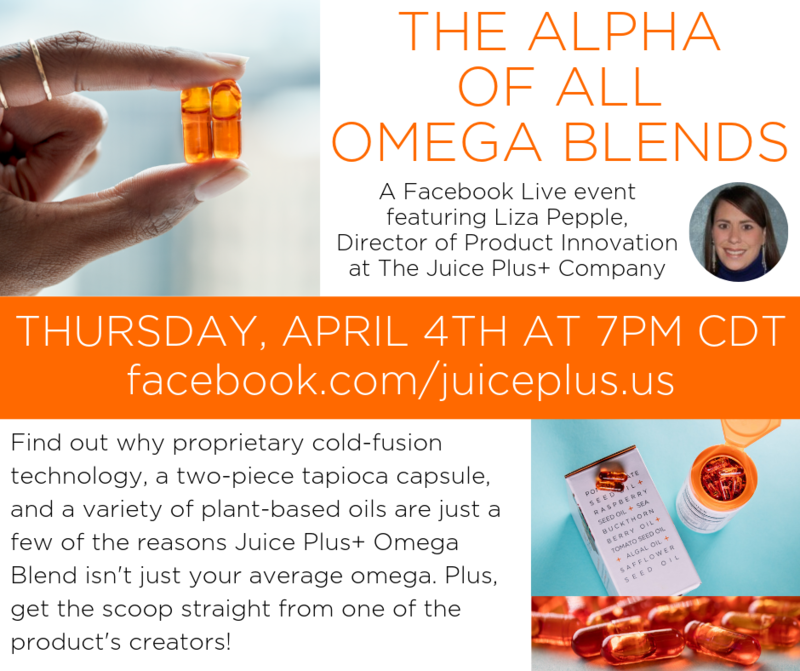 Please join us for our upcoming Facebook Live event, featuring Liza Pepple, as she delves into what makes Juice Plus+ Omega Blend so special and unique. This event will take place Thursday, April 4th at 7pm (CDT). Visit our Facebook page to take part in this event. We are excited to announce a new partnership between the Juice Plus+ Company and Teamzy! We have contacted Teamzy and negotiated a special price for all Juice Plus+ partners. Teamzy is already a great value, but we want to make sure you have the best deal possible! Teamzy is extending a special price of $19.95 per month, which is only 66 cents per day, or just $198 for a yearly subscription. Remember your first harvest? How proud you felt of your delicious homegrown salad? That feeling turns hobbyists into Tower Gardeners. With that in mind, we asked ourselves, what can everyone, beginner to expert, grow and enjoy? Leafy greens and herbs, of course! Now, when you or a customer purchases a Tower Garden Growing System, your seed sample pack includes Gourmet Lettuce, Arugula, Bibb Lettuce, Rainbow Chard, Black Dino Magic Kale, and Sweet Basil. Happy (and successful) growing! When new Juice Plus+ business partners join Juice Plus+, the goal is to paint the vision for them to move as quickly as possible to secure the maximum commission payout in our Compensation Plan. That is done by reaching the level of Sales Coordinator (SC). - Maintain a qualified business by the end of the March business month. - If the VF should already have an SC in their downline, that does NOT count toward required structure, nor does ANY of the PVC under that downline SC. We hope you are as excited as we are to offer you this limited, one-time promotion opportunity. Don’t let this incentive pass you by. Please be sure you are sharing this great incentive with every new Juice Plus+ partner joining your team, as well as all your current team members. CLICK HERE to view our video with more details. Memories are the plates of holiday fare. Without preparation you will find you have strayed. A shortcut to restart is what we most want to share. With greens and herbs grown with such loving care! CLICK HERE to find a Tower Garden Certified Seedling Provider near you. We are proud to announce our partnership with American swimmer Zane Grothe. 26-year-old Zane, who specializes in middle distance freestyle, holds several U.S. swimming records and is widely seen as a medal prospect at the 2020 Olympics. He is a “Juice Plus+ baby”, having taken our capsules all his life, and is now a rep, along with his sister Alexis. The two can be seen on-stage at our 2019 Texas Summit. CLICK HERE to check out an exclusive interview with Zane on our blog. Top Place to Work Again! The Juice Plus+ Company recently received the honor (again) of being named one of the Top Work Places of 2018 by Memphis' own Commercial Appeal. We do not take this honor lightly, as we know it is the diligence of our employees, in supporting you, and the unique culture of our organization that allows for us to be recognized for such a great achievement. Delighting customers with an exceptional brand experience is a surefire way to grow a business. Happy customers not only stick around — they also often become advocates, telling their friends and family about the product. The Juice Plus+ customer experience is already built to do this through Juice Plus+ Customer Account Access. All of these resources are available to your customers, and we make you aware of any changes or adjustments made by your customers. This gives you even more instant visibility than changes that are made through the Juice Plus+ Service Center. Customers have the option to create an account when placing an order on your Juice Plus+ website. If you have not already done so, you will need to create your own customer account, too. Meeting your customers’ needs and expectations for transparency and control will establish trust. This foundation of trust — along with the fact that your name and photo will be prominently displayed in your customer’s account — will help build stronger customer relationships. Plus, since your customers can manage basic account maintenance tasks themselves, you will have more time to focus on what matters: building your business. New details and incentives will be available soon, but only to those Juice Plus+ representatives that have their own account actively created. Please be sure to activate your account to take advantage of some exciting things coming soon. Being a part of the Juice Plus+ Community often has many perks. We are excited to share with you a new perk available to you and your team members through Office Depot. This perk will allow you to receive various discounts on products and print services with Office Depot. To take advantage of this great offer, text JUICEPLUSCARD to 555888. That’s something that everyone wants to know when considering the Juice Plus+ business. That’s why we’ve created the Juice Plus+ Earnings Summary, a one-sheet promotional piece, now available in your Juice Plus+ Virtual Office. We show the actual average earnings of all U.S. representatives for 2017, by position – and the numbers are impressive. Use the Juice Plus+ Earnings Summary when you're sharing the business opportunity with others. It's the one-and-only tool to accurately represent the potential earnings. Your prospects will definitely be impressed!